The DIY SOS project in Manchester is comfortably the largest build we've ever undertaken. It all came about after a chat I had with Ed Parker, founder of charity Walking with the Wounded, who told me he needed housing and retraining for veterans. We'd always wanted to do something with derelict housing stock in inner cities. It seems ridiculous we have people without suitable housing and empty homes. So we combined the two ideas, asked councils to offer houses, found a viable option in Manchester and off we went. We had 62 house fronts to renovate with new doors, windows and render; the road to resurface; eight houses to be stripped to their skeletons and rebuilt into three homes, a retraining centre and support offices. When only a third of the volunteers we’d hoped for turned up, we were in trouble. So we appealed for help in the national press, TV and radio. And it came. Volunteers came from Swansea, Devon, Glasgow, Leicester, Birmingham and Kent. But I have to admit, three days into our 12-day schedule I was beginning to believe we'd been over ambitious. I found myself quoting Henry V: "We few, we happy few, we band of brothers". And then THE brothers came along. 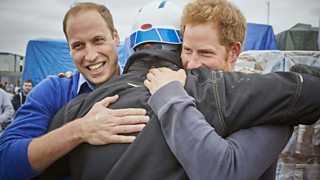 Princes William and Harry, rolling up their sleeves, swapping banter with the builders, taking as much time as it took to hear the veterans and even enjoying a builders’ man hug at the end of their stay. Everyone who got involved did so because they knew what was being done was important. I think the young men and women who had given so much for their country and face a lifetime of living with serious injuries, both physical and mental, should have access to suitable homes and retraining opportunities. They need help and a chance to get themselves back into a valued position, and feel comfortable in society and within their own families. This community will offer the support of living alongside other veterans with whom they share an understanding of what they've been through, whilst sharing the neighbourhood with non-veteran families too. There will be training opportunities through our build partners and the local tertiary college. There will be health support and job opportunities through a permanent north-west hub for Walking with the Wounded based in the road. It will be open to both veterans and other residents to give opportunity to all. When people at various stages said it was impossible, it only made us more determined to succeed. Like Jack's beanstalk, this project grew and took on a life of its own. We realised we could make so many things happen at once. This project has lifted an inner city area, housed vulnerable veterans and brought empty housing stock back into use thanks to partnerships forged between private business, charities, Manchester Council and the BBC. It was a simple but ambitious idea that simply grew and grew. I hope it continues to grow and is repeated around the country. But this - our biggest build ever - is only a fraction of the community that has been built overall. I hope that our shows will give you pause to reflect on what can be done if we pull together. Nick Knowles presents DIY SOS. 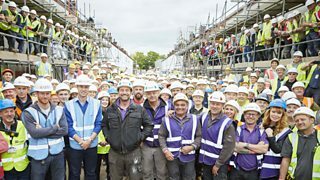 DIY SOS: Homes for Veterans is broadcast on Wednesday, 14 and Wednesday, 21 October at 8pm on BBC One. Each episode will be available in BBC iPlayer for 30 days after broadcast on TV.